PlayFrank Casino launched in 2014 with a simple plan of offering online gamers a fun and friendly place to play slots and casino games – a promise that it continues to deliver on. From the site's quirky and colourful design that has the vibe of an adults' play centre, to the innovative incentive club that rewards your loyalty, PlayFrank is perfect for those who don't take life too seriously. That said, don't be fooled by the soft exterior – this is a site with the scope to play many of the best slots, table games, live casino tables and jackpot games. If you're a gamer who likes a big range of software options to choose from, PlayFrank is genuinely a good bet. There are games on offer from more than 30 software houses, from the famous faces to more niche slots developers. 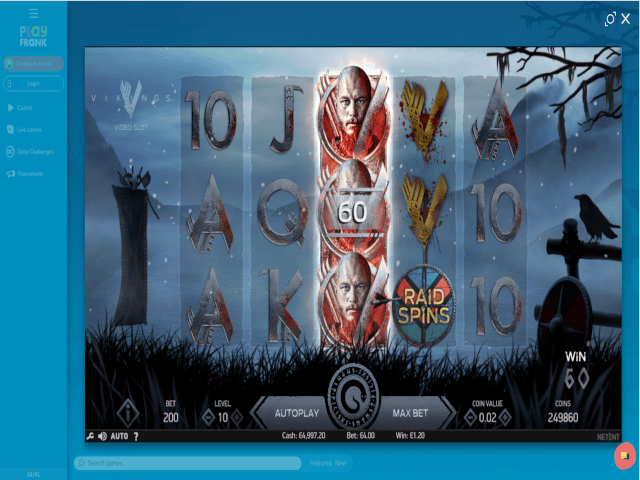 You can play slots from brands including ELK, NetEnt, BigTimeGaming, FantasmaGames, GenesisGaming, NYX Gaming, PariPlay, Microgaming, MultiSlot, IGT, Thunderkick and Quickspin among others. 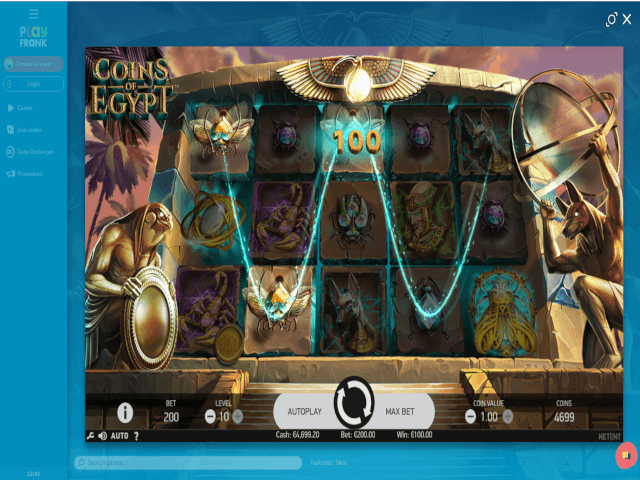 And if you're into live casino gaming as well as slots and tables, you can launch a live casino with the impressive dual power of Evolution and NetEnt. PlayFrank may look cute on the surface – but don't dismiss its horsepower. As intimated above, PlayFrank has a humble style that looks something akin the the ill-fated Toys 'R' Us. There's more than a suspicion that this team had a day at the park and decided that something playful was the way to go. In truth, the vibe is just that – lighthearted, with lots of white space, a blue hue and colourful navigation tabs. This soft approach leads you through a simple signup process, and offers you a pleasant way to surf around and check out what's on offer in the games lobby and in the way of promotions. Everything is simple to find, and once inside the gaming lounge, you can intuitively search by genre (such as slots, jackpots, live and table), or by software house or game title. Whether playing via laptop, PC or mobile device, PlayFrank's simplicity gives it excellent playability. 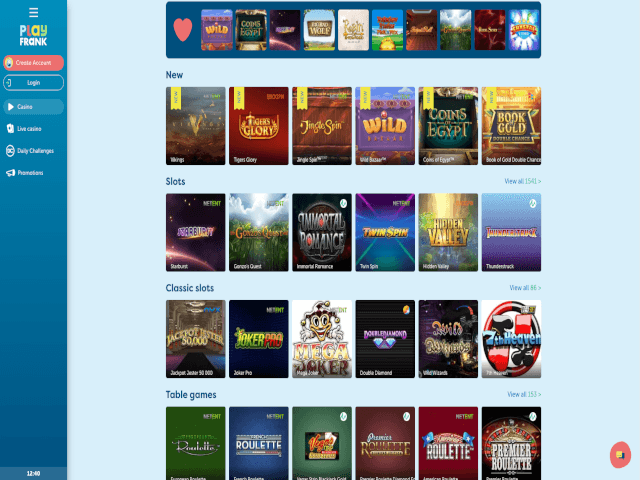 PlayFrank's gaming selection is vast and exceeds 1,500 in total across all genres. In the slot lounge, there are easily over 1,000 video slots to play, from a great range of software houses. This includes the option to select slot types from three categories: Video slots, Classic slots and Jackpots. Simply find the game you want and click on the icon to instantly launch it on your screen. If you're looking for a specific game or slots from your favourite developer, you can seek them out via the search boxes. The policy of PlayFrank to offer such a huge range of casino games and video slots means you can find virtually any theme of game, in addition to a stack of old classics and new releases. Does PlayFrank Offer Progressive Jackpot Slots? You'll typically find over 15 jackpot games playable via all devices, with real time multi-million jackpot sizes on the screen. 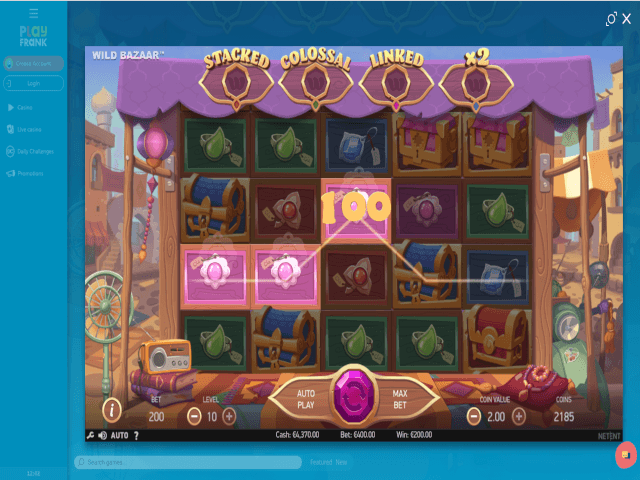 Can Players Demo PlayFrank Slot Games for Free? You can demo the slot games at PlayFrank even if you haven't created an account. Simply locate a game and give it a click to see what the fuss is about. Some games, notably the progressive jackpot slots, trigger a login and 'create your account' banner, but this can be shut down if you just want to play for free. PlayFrank offers banking methods via all standard credit and debit cards, plus other options including Skrill and Neteller. No Paypal or cryptocurrency options are available. Withdrawing typically takes up to 24 hours, but the site does often request proof of identity documents to protect new users. You can withdraw up to 10,000.00 per week without having to discuss your options with the support team. Currently, new players at PlayFrank can bank a 100% deposit bonus up to 100.00 and gain 50 bonus spins on Starburst. That means you can play with 200.00, when you deposit your first 100.00. The bonus cash must be bet x35 the total amount deposited and received, so a 200.00 total needs betting to the value of 7,000.00. The site also offers unique daily challenges, which can be unlocked to earn bonus spins and rewards. For longer-term players, the Tracks, Levels, Rewards concept acts as a loyalty scheme, with the chance to earn and get rewards for regular gaming. The site is fully licensed to protect gamers and deliver fair gaming. In addition to a detailed FAQ section, PlayFrank also offer responsive 24/7 support via live chat and email.